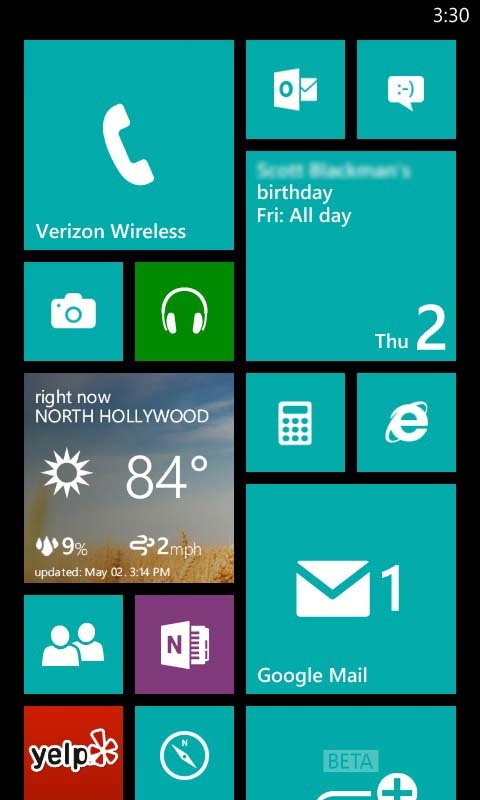 I’m Lovin’ my Windows Phone! My brother, who works at Microsoft, has been telling me for a couple of years that I need to check out the Windows Phone. I’ve tried almost all the major platforms: Android, iOS, Palm, and earlier versions of Windows phones. I was very happy with my last two Android-based phones, so when my contract expired in February, I assumed I’d just get the Galaxy S3. But when I got to the shop, I was intrigued by the Nokia 822 Windows 8 phone. I decided to test it out a little and found that I really liked the interface. The Verizon shop also had a Galaxy S3 on display so I switched back and forth between the two, seeing how liked them. I came to the conclusion that the Windows interface had a much fresher feel to it. So, contrary to my original plan, I decided on the spot, “What the heck, let’s get it and see how it goes.” I had 14 days to return it and get something else anyway, and was prepared to do just that if they phone let me down. It’s been two months now and not only did I keep the phone, I really, really like it, and here’s why. The very first thing I did was attempt to find all the apps I used most often: Bank of America, Foursquare, Facebook, YouTube, IMDB, LinkedIn, Netflix, OneNote, Pandora, Rhapsody, Shazam, Yelp. I fully expected several to not be available, which would be a very good reason to return the phone. To my surprise, they were all there waiting for me in the app store. No doubt the number of apps in the Windows store is paltry compared to iOS and Android. But MS has done a good job getting some of the really important ones in there. The Windows phone start screen is pretty great. From the minute I started using it I preferred it over anything I’d used in previous smartphones. It’s fast. It’s responsive. It’s active. And perhaps most importantly, it’s simple. The flat design style is refreshing and pleasing to the eyes. No high gloss or shadows or rounded edges. Just quick easy access to the apps I use most. Furthermore, the mobile experience is much more integrated rather than being just a bunch of individual apps. For example, when I open the people app, all my FB friends–including their status and pics–are there right alongside my phone contacts. And, my FB photos show up as a photo album on my phone so I can easily view and share them there without needing to log into FB. With the windows phone, all audio apps are accessible through a common playbar that includes play/pause, previous and next. When the phone’s in standby and music is playing, just press the power button and the lock screen appears with this playbar right at the top, no matter which music app you happen to be listening to. I absolutely love this feature. No more searching for the app that’s playing or logging into the phone to get to the notification bar, pull it down, and THEN find the app. This feature is really smart and a real bonus for me. We use Microsoft Exchange and Outlook for email at the office. I can’t tell you how much I struggled getting my business email to work on my Android phones. My gmail account worked great, of course, but MS Exchange support always felt like an afterthought, at best. Not so with the Windows phone. I just entered my email address, password, tapped submit, and boom. Email, calender, and tasks sync beautifully and in near-real-time with my office so I never miss a thing. I’ve been using OneNote for a few years now and I absolutely love it as a note app. On my Galaxy phone, I installed the OneNote app as soon as it was available, but it was huge and couldn’t be moved to the SD card, so when I started maxing out my memory, it was one of the apps that had to go. On Windows phone, it’s already there. Once I logged into my Windows account, my notebooks were instantly accessible. One of my biggest concerns with anything Microsoft is performance. I had a Windows phone five or six years ago and it was pretty terrible. Apps were slow to launch and there were the frequent Windows-y hang ups we’re all too familiar with…as in…”Why is this window taking so damn long to open or close? Really? It’s just a simple email reply. This should be much faster!! Oh. Now it’s frozen. Great. Reboot.” Needless to say, I was apprehensive about how this phone would rank in terms of performance with real-world usage. I’m happy to report it is a completely different experience. Apps launch quickly and the OS manages it’s memory and CPU well. I never get any screen hangups. Ever. And I leave this thing on 24/7. No reboots necessary. It’s even better than my Galaxy S, which was pretty zippy at first, but the more apps I loaded on it the slower it got. And, the more apps I ran, the worse the performance was to the point where I had to reboot it nearly once a day to clean up the memory. I tried memory/cache cleaners and they would help some, but a reboot was inevitable at least every other day. It just did NOT do a great job cleaning up after itself in terms of memory management. I realized when deciding which phone to get next that my priorities are: 1) business, 2) social, 3) entertainment. With those priorities in mind, this device is really perfect for what I want out of a smartphone. For those who are more into gaming or want to have the latest trendy apps, it’s much too early to jump on the Windows phone bandwagon. Until and unless we start hearing a majority of app makers say “Now available for iOS, Android, and Windows phone,” this will not be a phone for the masses. And, I’m well aware that day might never come for Microsoft. I’m also all too familiar with Microsoft’s tendency to kill a product without warning. So it’s very likely that in a couple years there won’t even be any Windows phones. But, for now, I’m really really happy with it. Really.